Winning against the Mamluks is easy this time around: after the last big war, they’re no longer in my weight class. I don’t go for the 100% warscore, however, settling for a 70-80% win just because of the timing. After that, I grab the bull by the horn and declare war on Portugal. The following war goes smoothly, thank to my ally France. 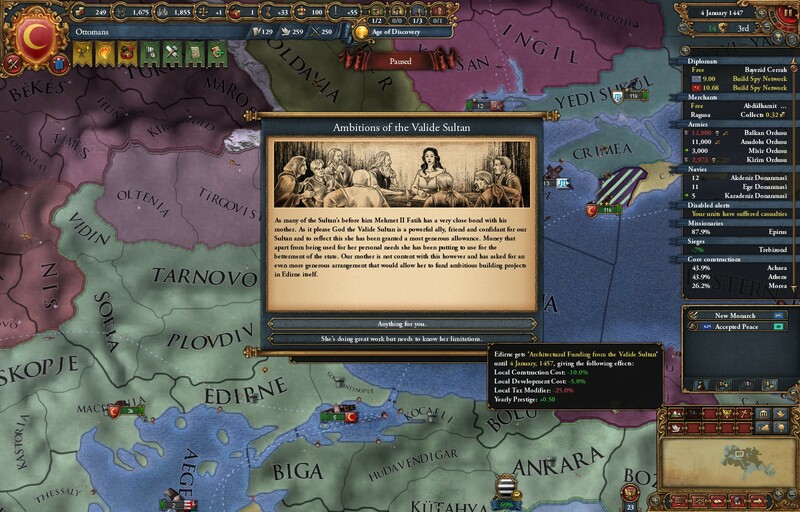 I end up cutting Portugal down to “make it a vassal next war” size, and taking another quick bite out of Castille. And then it becomes complicated. My AE is high enough in the Christian world that I want to keep away from them for a few years at least. But conquering in the Muslim world will create more countries with high AE. So planning my next move is a bit more difficult than I’d like. I decide to take more land from Qara Q, which works out to putting me near the limit of AE with a bunch of nations, then get ready for a war with Castille. That works out great… except it starts a coalition against me. Uh oh. As usual, the first coalition that forms can easily be broken up by diplomatic means. Until it does, however, I worry. A lot. But it eventually dissolves, and I turn my attention back to less hostile pastures. Like the Mamluks. I go for another quick war there, just to throw them back at truce. My next big step is the vassalization of Portugal, which is likely to be a high-AE affair. I can’t really afford to have too many countries pissed at me now. Besides, I can use a couple of years of peace. When we last left off, I was planning on ignoring Europe for a while and focusing on the Muslim world. And then numerous opportunities knocked. I took out some small Islamic countries, but then Naxos and Corfu were just there. And the reborn Knights were allied with Corfu, too! And Crete broke free from Venice! And then there’s Serbia, right there! …You get the idea. 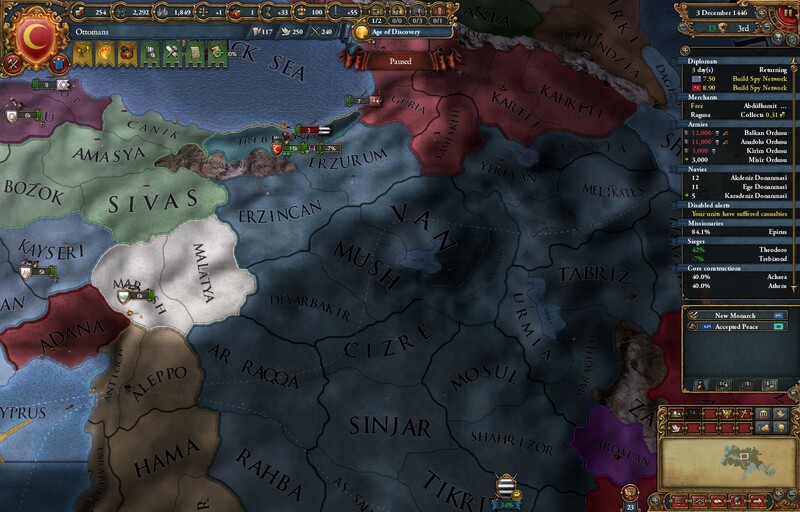 I did get into an initial tussle somewhere in there with the Mamluks and Dulkadir, but I peaced out after a quick landgrab as I wasn’t in a good position for a long fight. But that is my next target. I really do have to let Europe relax a bit more now. While that truce runs out, I keep seizing those small opportunities, and then allow myself a few years of peace to let my manpower recover, and to deploy sufficient amounts of cannons to make the next war easier. And it is easier – I end up taking a 100% warscore peace deal, breaking off large chunks of the Mamluk’s empire and especially their hard-to-punch-through forts in Aleppo and Damascus. And then I hit an important decision point: Castille is at war. France is willing to join me in a war against Castille. It’s, technically, an opportunity. So I decide to be manly, and move onto Castille. And I win. Admittedly, not a huge, game-changing victory, but that’s two provinces less to conquer later on. And it’s a confidence booster. And it’s more AE that can bleed off in time. After that, it’s more opportunities. Qara Qoyunlu. Genoa. All get downsized significantly as I see good chances to weaken them. And then… time to get ready for another big war against the Mamluks. So I need another fix. 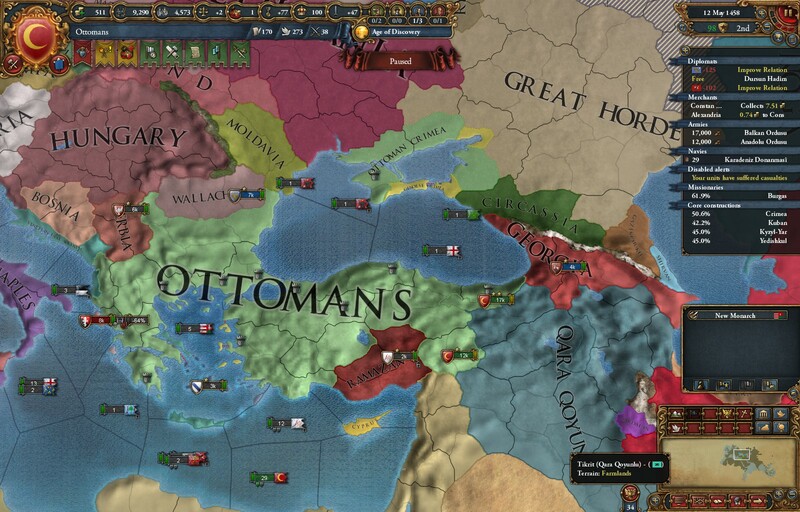 Try to go for an Ottoman World Conquest again! I’ll be a bit more efficient on posts going forward, however. A blow-by-blow is kind of boring, so we’ll just hit the highlights. The World Has Changed. 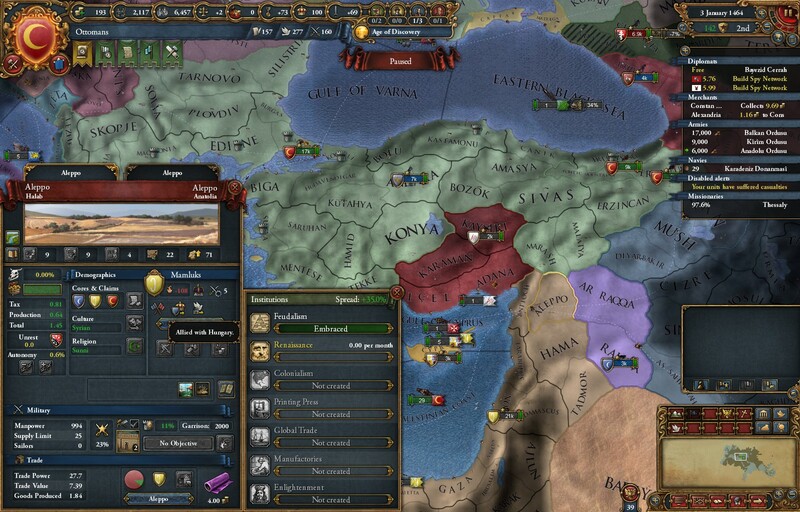 In particular, the Ottomans no longer have bunches of cores to reconquer in Anatolia, meaning they generate a lot more AE than before. On the other hand, I don’t necessarily want to rush as fast as I usually do: in retrospect, it’s much better to have a solid economy in place and to hit the important tech levels as early as possible than to have grabbed every last 1/1/1 province I can grab in Siberia. So… let’s talk about the starting years. One of my goals is to vassalize the colonizing European countries as early as I can. If I vassalize them, they will create colonial nations for me, effectively conquering the New World in my name. To do so, I declare unprovoked wars on Granada and one of the minor Irish kingdoms. The idea is to create bridgeheads on parts of Europe. It does create a rather stupid amount of overextension, but that’s fine – an early coalition of Irish minors form, but it’s manageable with diplomacy. When I finally vassalize it, turns out it’s already at war with its neighbors and so I get to grab another province for my newly-minted vassal. Then it’s time to seize Constantinople, a bit ahead of history (but later than I usually do). But that’s fine, it lets me work away some potential coalition-forming countries in Ireland. After that, I seize an opportunity to take out the Knights (and their annoying raiding ability) along with Cyprus. I do that in a way which lets me skirts coalitions, but after that it’s time to take a year off (and then to focus a bit on the Muslim world, as the Christians are pissed at me right now.